It was a sudden plan to visit Kylie with a friend recently. All we wanted was a quick bite and first name came to my mind was Kylie's. Thanks to all my foodie friends who posted reviews about this place. 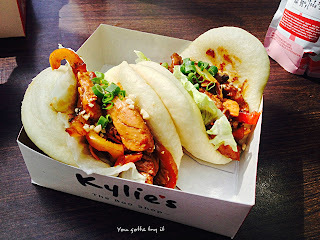 Located in Churchstreet, Kylie's is a tiny food joint which serves amazing baos. Many people asked me what's a Bao? A Bao is a sweet Chinese bun which is very light and fluffy. Kylie's serves fresh Baos with variety of fillings- Veg, Chicken, Fish, Mutton and Pork. We both had the succulent Spicy Kung Pao Chicken Bao which was quite filling. The crunchiness of peanuts and lettuce leaves, along with the chilli honey sauce made the chicken bao more delightful. Each bite was full of flavors. We couldn't try any other Baos, but will surely go back to try the other baos from their menu. As they don't serve any fresh drinks, we opted for a Paper Boat drink. My only suggestion to them is to do something about the seating arrangement as Summer has already hit Bangalore and we need some shade to enjoy the baos. Chicken Baos are priced at Rs.130/- and it's total VFM.